In 2005 we paid the island of Koh Lanta in the southern part of Thailand a first visit. The south was still unspoiled and development of the coastline within limits. In 2012 most of the original tranquillity was preserved although one could clearly see the strain the tourists were leaving already on the island. Today Koh Lanta is one of Thailands best all-rounders. Less than an hour’s boat ride from Krabi, Koh Lanta is actually made up of several little islands, the most-visited of which is Koh Lanta Yai. Today it still has got nature reserves and beaches where you won’t see another soul. 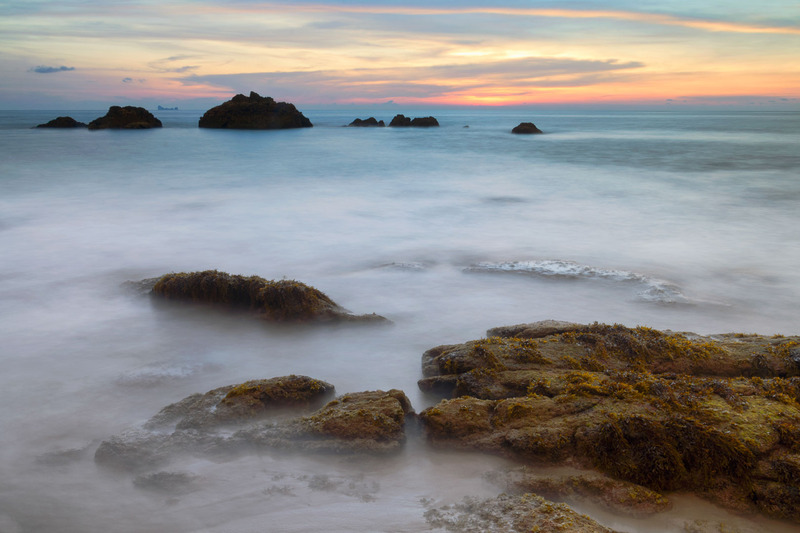 Koh Lanta is famous for its fantastic array of beautiful, unspoilt beaches. Those beaches located to the north of the island are more developed as they are near the port of Ban Saladan – the further south you go, the more remote and peaceful the beaches become, but also with less amenities. Low season is in many ways the perfect time to visit Koh Lanta - prices are cheap (the hotels that stay open slash their prices by up to half of those in high season) and the beaches are completely deserted. 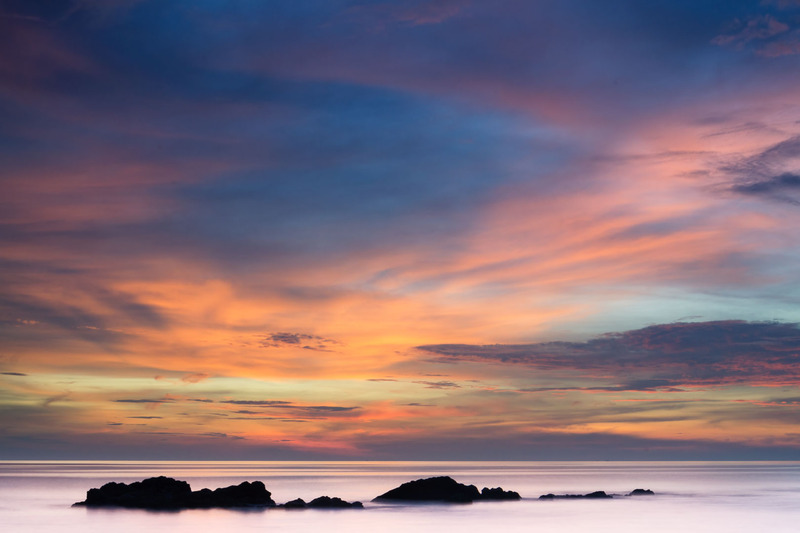 If you are looking for a "getaway from it all" holiday in a place that will be very happy to see you, Koh Lanta during May to October would be ideal. And of course, it does not rain all the time, either! 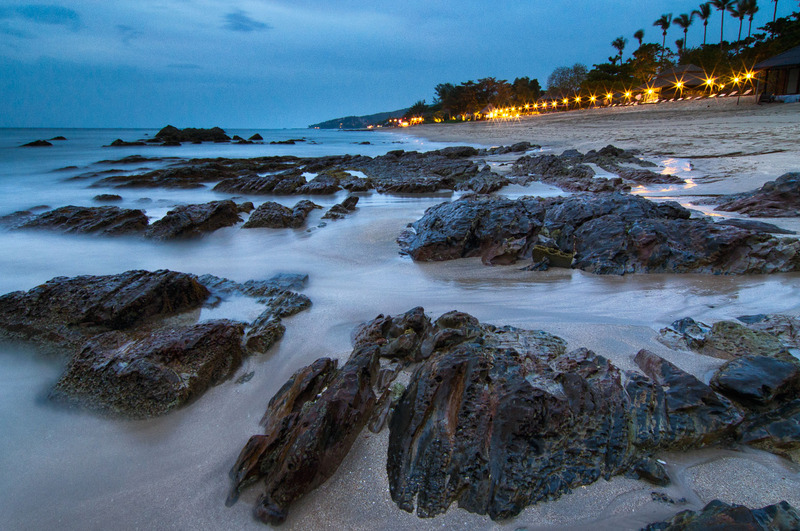 During the low season (May - October inclusive), it is fair to say that Ko Lanta shuts down. Unlike mainland Krabi and Phi Phi, rough sea conditions mean access is relatively harder. The passenger ferries stop running altogether (although there is still access via the car ferry); and all off-island excursions (island tours etc.) do not run. Sunsets over a quiet and tranquil ocean are fantastic nonetheless. 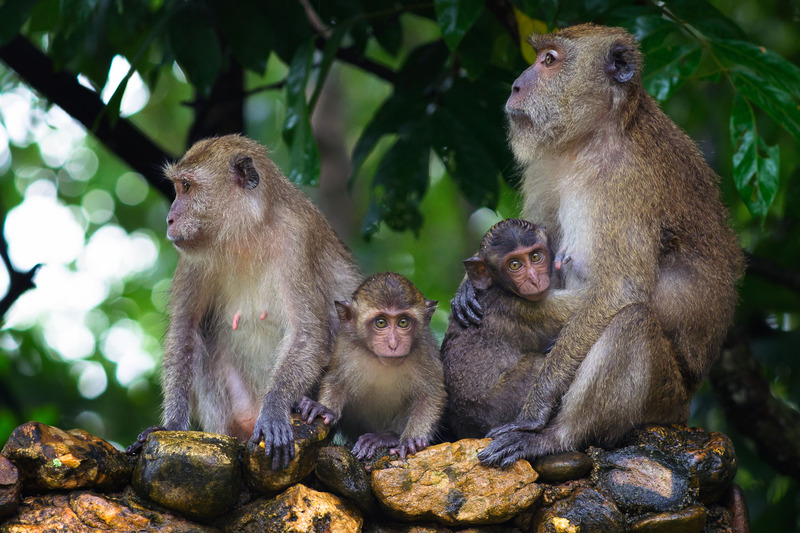 The crab-eating macaque, also known as the long-tailed macaque, is a primate native to Southeast Asia. 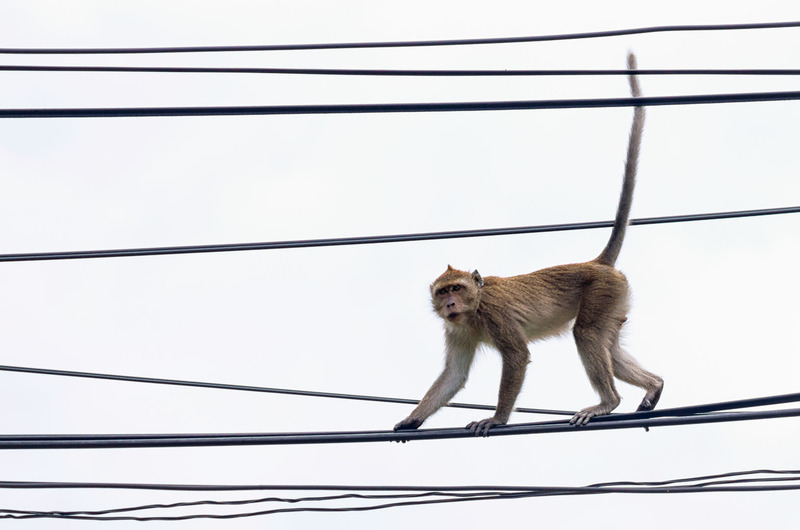 It is referred to as the cynomolgus monkey in laboratories. It has a long history alongside humans; they have been alternately seen as agricultural pests, sacred animals in some temples, and more recently, the subject of medical experiments. With its nice green colour and a pair of cream-colored bands with dark lining running along the sides of the body, it is one of the most beautiful south-Asian frogs. The upper lip is white and joins a white stripe running over the arm pit and along the lower part of the side. Its size is between 4,5-7,5 cm. Distinct disks are present on the digit tips. It is mainly nocturnal. It may be encountered perching on grass or reeds at the waters edge. In regions with regular rainfall it can reproduce all year round. 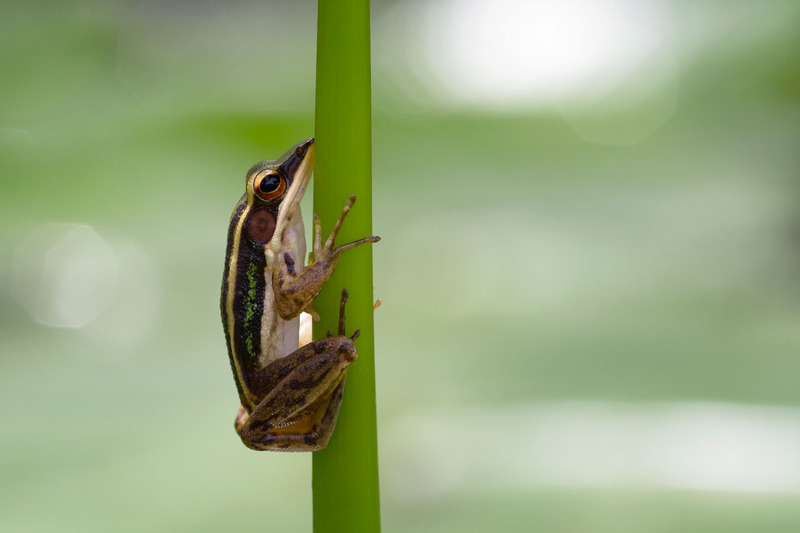 Although it has toe pads like tree frogs, it is rather living in water bodies. Rana erythraea eats small terrestrial invertebrates, such as small millipedes, crickets and ants. 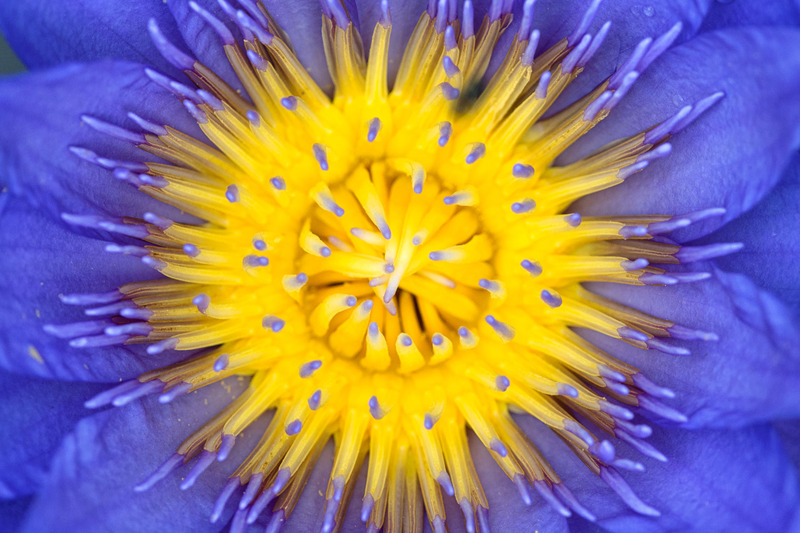 Green paddy frog (Hylarana erythraea) inside the flower of a sacred blue lily (Nymphaea caerulea). 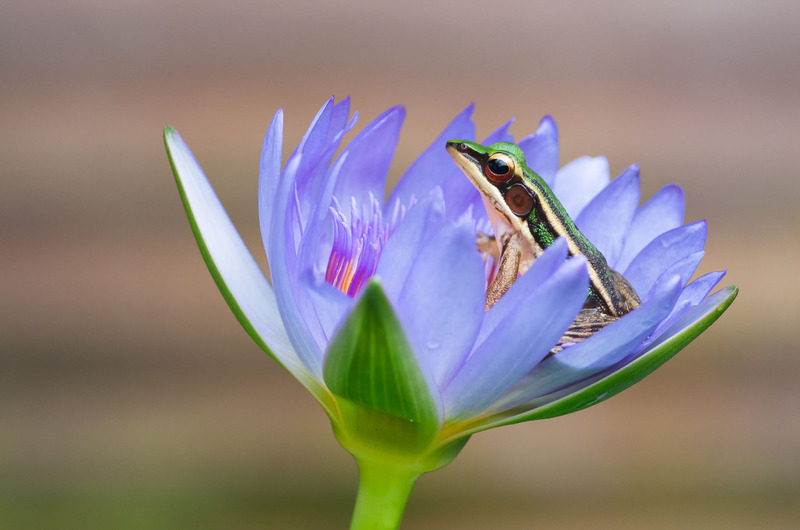 The green paddy frogs have learned to climb inside the flowers of the lilies to feed on the insects that come to visit the flowers. 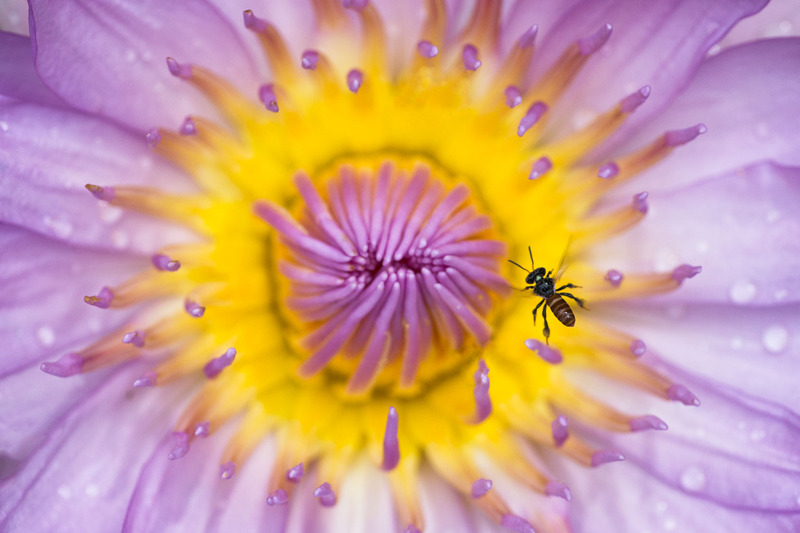 Stingless bees, sometimes called stingless honey bees or simply meliponines, are a large group of bees, comprising the tribe Meliponini. 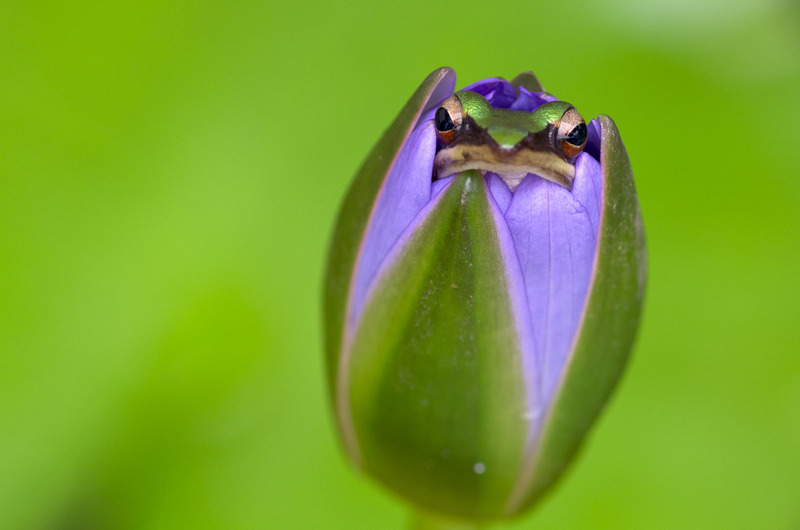 Green paddy frog (Hylarana erythraea) inside the flower of a sacred blue lily (Nymphaea caerulea). 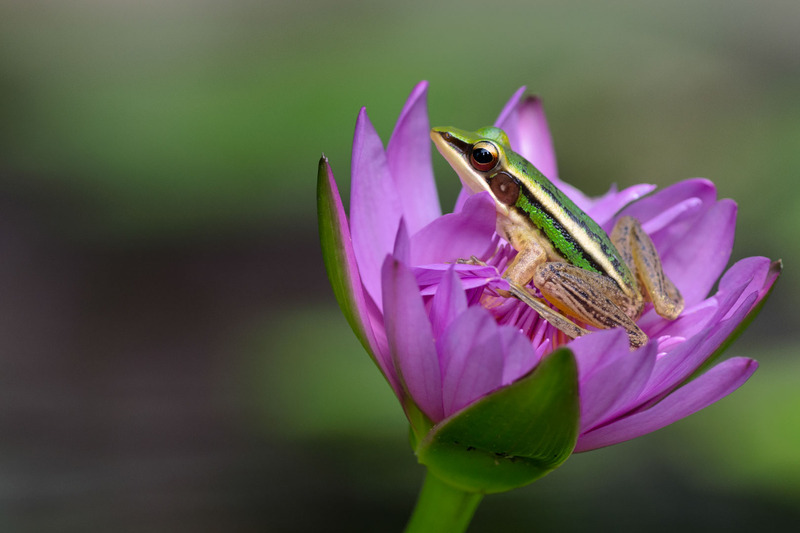 The green paddy frogs have learned to climb inside the flowers of the lilies to feed on the insects that come to visit the flowers. 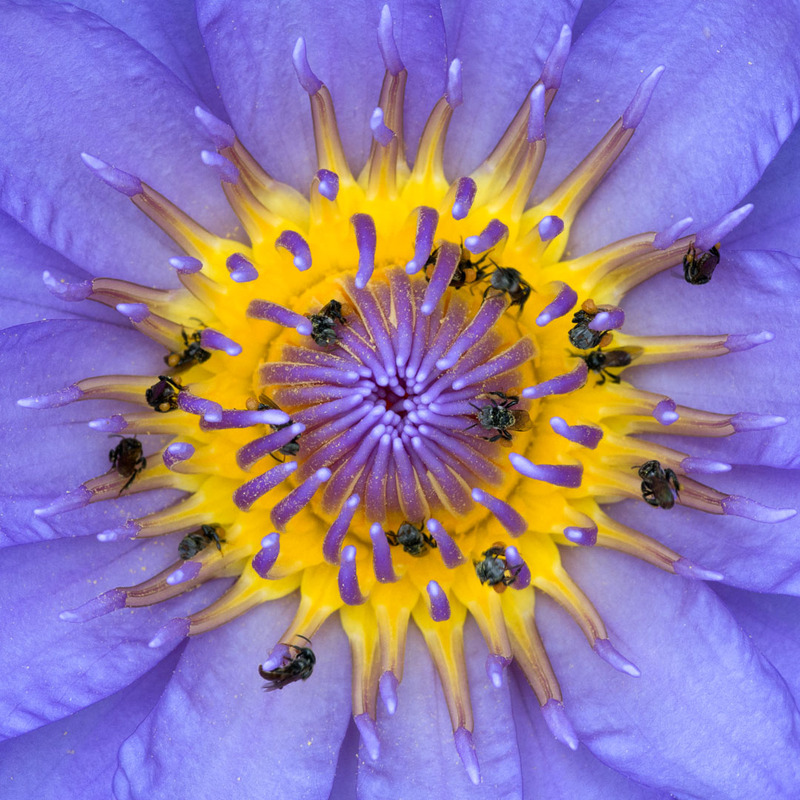 When night falls or when it starts to rain, these flowers close. This paddy frog was caught in that act! 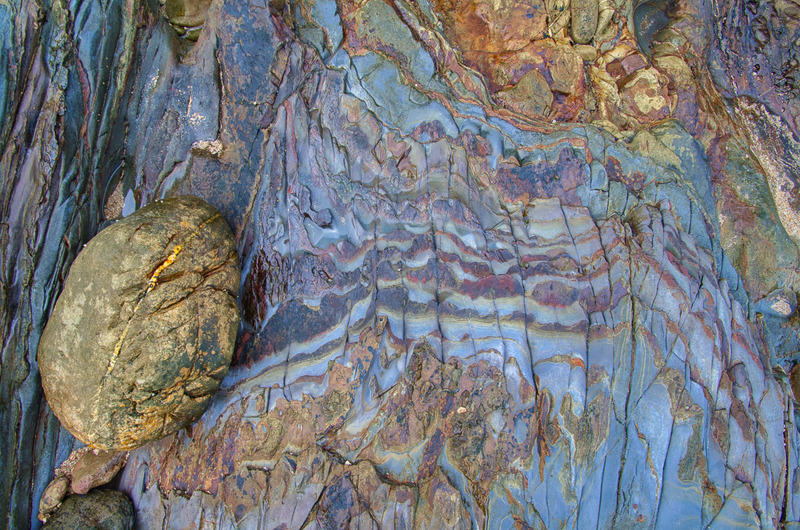 Found on shores near the high water line, among large boulders, on land grassy areas and even some distance inland. Always active at night. They feed on plants and scavenged food, often going far inland to forage for food. The Land hermit crab is so well adapted to life out of water that it will drown if kept underwater! It has special gill chambers that act as lungs. These chambers are large and holds water to keep the gill filaments wet. The hermit crab only needs to occasionally dip in either rainwater or the sea to keep the chambers wet. Females, however, must go to the edge of the sea to release their eggs into the sea. These hatch into planktonic larvae. 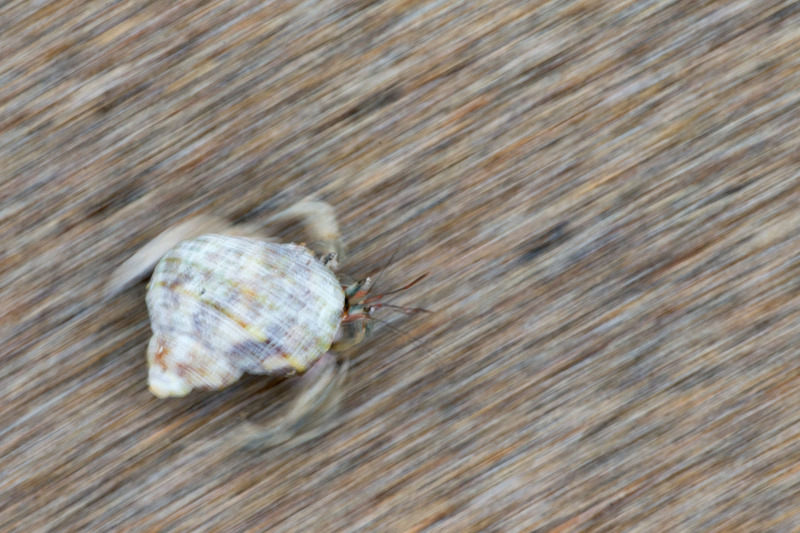 When the larvae develops into a small hermit crab, it finds an empty shell then heads landward. 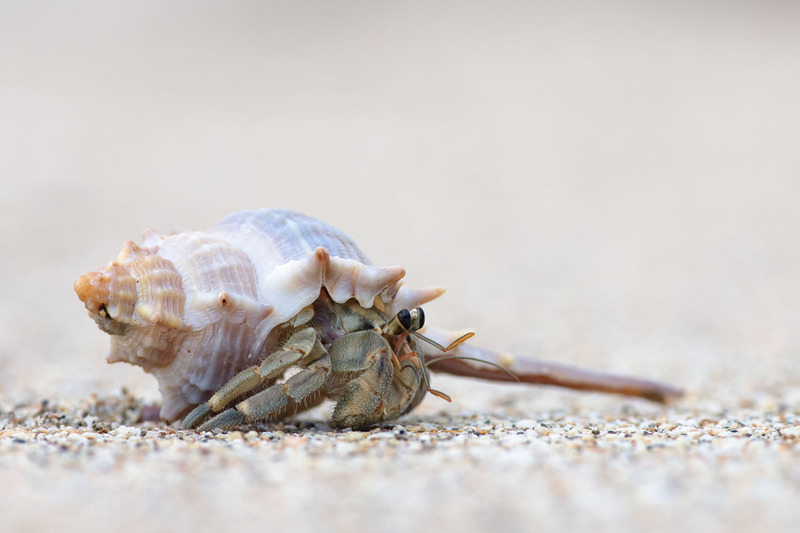 Hermit crabs change their shells regularly but only when they find a larger and newer shell to feel safe in! Moo Koh Lanta National Park Covering most of the southern tip of Koh Lanta Yai, this large nature preserve is a mix of jungles, hills and beaches. Tanod Beach in particular is known as one of the most idyllic places in the entire province. Even during the peak of the tourist season you can relax on this beach and not see another soul. There are plenty of trails to explore as well as an old lighthouse, from which you can get an astounding view of the azure waters that surround the island. As their common name implies they posses eyestalks extending beyond the eyes into long points, which are longer in adults, and shorter (or even absent) in juveniles. 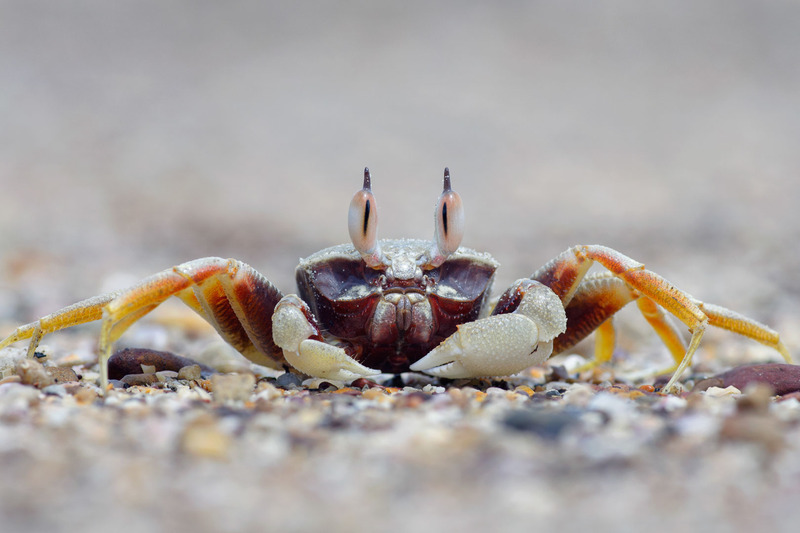 The crabs have a box-shaped body, 6–8 centimetres across the carapace, with a darker markings towards the rear in the shape of an H. The outer edges of the eye-sheaths are also sharp and broadly triangular and distinctly pointing sideways in larger individuals. They can run at speeds of up to 2.1 metres per second!